Herbal Rainforest™ es un suplemento líquido con sabor a mango que libera los nutrientes de 16 hierbas y 77 minerales de plantas prehistóricas en su forma coloidal inalterada. 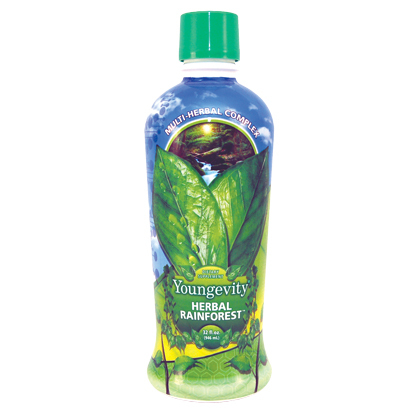 Herbal Rainforest is a blend of 77 organic liquid minerals derived from plants and herbs (16 chamomile flower, Echinacea, sarsaparilla root, Golden Seal, celery seed, alfalfa, dandelion root, Eleuthero root, root Horehound, licorice root, Ginkgo Biloba, Passion Flower, Thyme, Saw Palmetto Berries, angelica root and cascara). ADDRESSES: Store in a cool place after opening. Herbal Rainforest has a mango flavor pleasant taste and can be consumed directly or in combination with so favorite fruit juice or vegetable. Suggested as a food for special dietary uses. For adults, mix one ounce per 100 pounds, 1-2 times a day. For children, one teaspoon per 25 pounds. WARNING: If you are pregnant, nursing or taking medication, consult your health professional before using this product. If you take MAO inhibitors, consult your health professional before using this product containing Ginkgo Biloba.